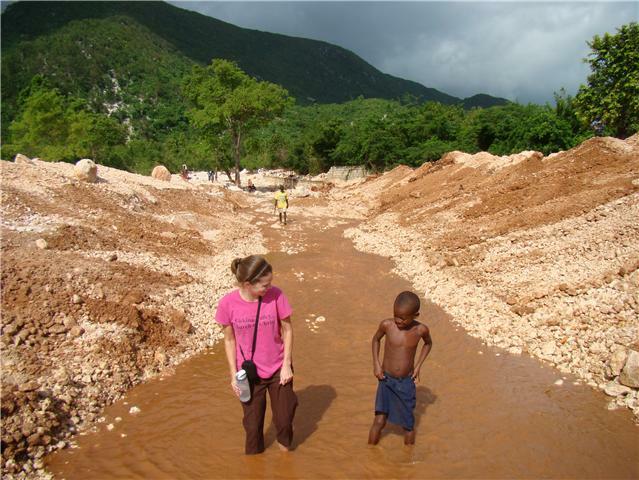 Ginny in Haiti: Mesi Petit mwen! There is a little old man who had a block fall on him at his house during the earthquake. He came to out clinic and had an abcess on his side where the block had hit him. The doctors opened it up and put a penrose drain in to let the infection drain. He comes in daily for dressing change and was getting a shot of Ancef everyday to help with the infection. When he would come in he talked to me about what was going on at the clinic that day while I was getting his shot ready. Everyday after I gave him his shot he wold say, "Mesi petit mwen." (translated-thank you my child) I would laugh and tell him he didn't have to thank me for giving him a shot. But the next day it was the same story. The penrose drain finally got taken out and we were packing his wound and everyday. It was healing but really slowly. I started thinking the reasons for this and realized his nutrition was probably not so good. When I asked him when was the last time he ate he said, "2 days ago." I got him my granola bar out of my bag I had brought for lunch and a Boost nutrition drink someone from one of the teams brought to the clinic for malnourished patients. Then I gave him the equivilant to $2 US in Haitian money and told him to buy himself dinner that night. I did this for the next couple days but when he would return he never asked me for anything. Not for food or money. I had to take him in another room away from others to do this b/c I can't give it to everyone. I would guess he is about 70 yrs old and always had the same clothes on everyday. I found myslef looking forward to seeing him in the clinic everyday. His wound is pretty much healed and he doesn't need to come to the clinic for that anymore but I told him to come back and see me if he needed anything. His looked at me and nodded his head and left with saying, "Mesi petit mwen."